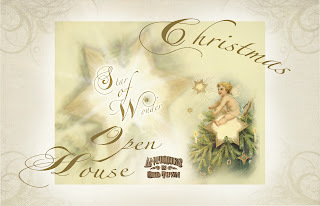 We have had so many requests as to when our Christmas Open House will be.... 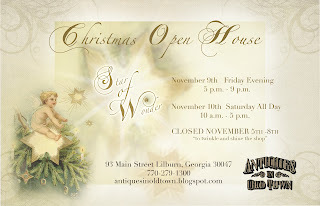 This year it will be on Friday evening November 9th from 5 pm to 9 pm and on Saturday November 10th from 10 am to 5 pm . The Shop will be closed from the 5th to 8th to Sparkle and Shine for" STAR OF WONDER". Be sure to mark your calendars ! It's only 6 weeks away ! Stitching up some pillows for our front window display. Love all the creams and whites. I have so many ideas that I want to try. This fabulous fluffy yarn is so fun to write and stitch with. He sends his Angels to keep us in all our ways....how BLESSED we all are ! Have a Great Fall Weekend...Autumn begins officially Tomorrow ! Another pillow to share... These are so fun to make ! Today is my Birthday and I want to thank all of you who called and sent such sweet messages...You Made My Day...Love You All ! I even got the most WONDERFUL Chocolate Cake.....YUM ! Makes having a Birthday Great ! Thank You to all who came by yesterday ! We had a very busy day replacing our front entry and helping our GREAT customers ! As my Hero says...We did the work of 4 with only 1 and a half persons...me being the short one who always has to get a ladder. We managed to get up 3 new bigger side and top doors without breaking any glass ! Just finished stitching a bird pillow...sharing it too. Laboring on Labor Day...Today we are creating a new front for the shop entrance ! Hope your labors are fun ones... Pictures soon... Yes , the Shop is OPEN today , come on by !